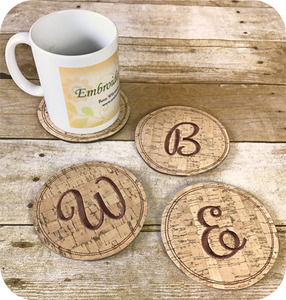 Quick, simple and classic describes these coasters. They're made using natural cork fabric and felt. Cork fabric is similar to thin leather and embroiders easily. It's water & stain reistant. You can wipe it clean with soap and water. You can use any non-fraying material. Stitch sets for gifts, craft shows, etc. All coasters fit within a 4x4 hoop.